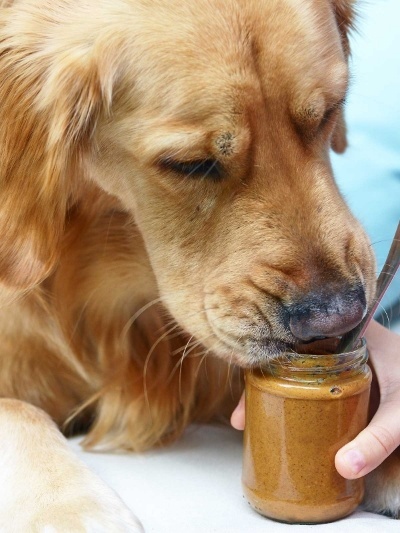 If you’re like many people, you might want to give your dog some peanut butter as an occasional treat. Or you might want to use peanut butter as a trick or reward to get your dog to take their medications? In many cases this is perfectly fine (so long as it’s not in excess — as too much can cause pancreatitis and/or contribute to obesity). However, with the introduction of a unique line of peanut and other nut butters onto the market — Nuts ’N More® — the answer to the question of whether or not it’s safe to give, even a small quantity of, peanut butter to your dogs is no longer a straightforward one. Why? Because of the sweetener that’s been used to replace the sugar in this line of peanut and other nut butters. That sugar substitute is called xylitol. UPDATE #1 (June 14, 2015): We have learned of a second brand of peanut butters that also contain xylitol — Krush Nutrition. We will be reaching out to them to discuss adding awareness to their product packaging. They currently provide a “Xylitol and Dogs” warning in the FAQ section of their website, as well as on their product pages. UPDATE #3 (August 6, 2015): The list of peanut and nut butters containing xylitol that we have uncovered has now grown to FIVE! We have reached out to all of them to discuss this dog hazard and to secure increased awareness on their product packaging and websites. We will continue to keep you updated with progress. Here are the five companies (in alphabetical order): (1) Go Nuts, Co., (2) Hank’s Protein Plus Peanut Butter, (3) Krush Nutrition, (4) Nuts ‘N More, and (5) P28. While these are “specialty butters” that are mostly sold in nutrition stores and online (currently), the subtle presence of xylitol in these butters definitely highlights the importance of reading ingredient labels on products you bring into your home, and especially doing so prior to sharing anything with your pets and if your pets ever get into anything they shouldn’t have. Please don’t assume that things which are safe for you are also safe for your pets. As you’ll see below, this can be a very dangerous assumption with xylitol! Is Xylitol Safe For Dogs? Xylitol is a sweetener that’s gaining in popularity because of its dental benefits for people as well as its suitability as a sugar substitute for people with diabetes. Because of its ability to help prevent cavities and tooth decay and its low glycemic index, xylitol is proving to have some good dental and other health benefits for people. Unfortunately, while xylitol appears to be perfectly safe for people, it is extremely dangerous for dogs — even in small quantities. Ingestion of as little as 0.1 gram (g) of xylitol per kilogram (kg) of body weight (0.1 g/kg) can cause a rapid and dangerous drop in a dog’s blood sugar (a condition called “hypoglycemia”). Hypoglycemia can show as staggering, appearing disoriented, collapse, weakness, and seizures. Just slightly more than that, approx. 0.5 g/kg xylitol ingestion, can lead to debilitating, and sadly often deadly, destruction of a dog’s liver cells. These quantities, or toxic doses, are based on the data that the animal-specific poison control hotlines have collected from reported cases*. To highlight that these are reported cases is important, because not every case of toxicity makes it to the vet, and not everyone that does go to the vet is called into the animal poison control hotlines. So the actual toxic doses could be even lower, and dogs with certain pre-existing medical conditions (such as diabetes, hepatitis, and others) are likely to be even more sensitive to the toxic effects of xylitol. The gaining popularity of xylitol as an ingredient in a growing number of products (incl. gums, mints, chewable vitamins, and many others) highlights the importance of reading ingredient labels, as well as the danger of assuming that what’s safe for you, or even your kids, is also safe for your pets. We have reached out to the folks at Nuts ‘N More® to ensure that they are aware of this danger and to ask them to help people protect their dogs by adding appropriate warnings to their packaging and website. We will update this post when we hear back from them. UPDATE #2 (June 16, 2015): We have heard back from Nuts ’N More®. They have said that they are willing to work with us to help ensure that this important awareness effectively reaches their customers and other dog lovers. Please stay tuned for additional updates. Please learn more about the danger xylitol poses to dogs and the range of products xylitol is commonly found in. And since awareness is truly crucial to helping people avoid xylitol toxicity in dogs, please share what you’ve learned here with your dog-owning and dog-loving friends and family. Please contact a pet poison control hotline right away and they’ll be able to guide you as to what to do next. If you want to make a great homemade nut butter here’s a recipe from our friends at Show Me The Yummy. The recipe includes notes to make it dog-friendlier by cutting down on or eliminating ingredients like salt and sugar. Teddy, the photogenetic dog in our article, is their nut butter taste tester. Enjoy!! Comments Off on Is Peanut Butter Safe For Dogs? Please Beware – Some Could Be Deadly! Posted by Reflection of Nature on January 6, 2016 in Is Peanut Butter Safe For Dogs? Please Beware – Some Could Be Deadly! Tags: Is Peanut Butter Safe For Dogs? Please Beware – Some Could Be Deadly!